Wanna cry? Tune in to apparently any episode the final season of American Idol! Wednesday night’s round of auditions featured Brenda K. Starr’s daughter—with a lengthy appearance by Brenda herself—and a performer who accidentally shot and killed his brother when he was eight years old. Jesus. If you’re not familiar with Brenda K. Starr, she’s probably best known for her 1987 ballad “I Still Believe,” which was famously covered by Mariah Carey. Starr also used to rehearse at the same dance studios as Jennifer Lopez, we learned last night, which meant they also had a bit of a reunion, as the judges voted her daughter Gianna Isabella through—but not before Starr teared up explaining how hard her daughter has worked and how they’re best friends. Next let’s move on to John Arthur Greene, who is currently performing in Matilda on Broadway. When he was eight years old, Greene accidentally shot his brother with a gun he didn’t realize was loaded while they were playing a game of Cops and Robbers the night of his parents’ wedding anniversary. “I held my brother and watched him die. I knew it when I had him in my arms. I knew he was gone, and I knew it was my fault.” Greene—who says music is what helped him get through what is frankly about the most tragic experience a human can have—was voted through to Hollywood. 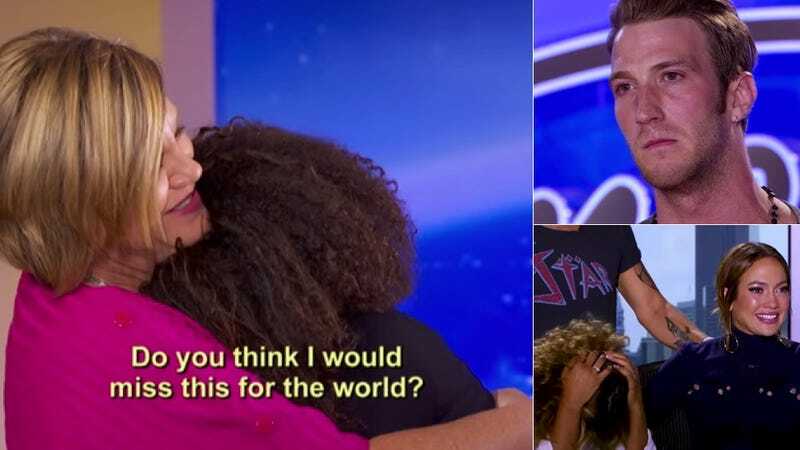 And don’t forget about last week’s episode, when the judges surprised contestant Tristan McIntosh with her own mother, who came back from serving overseas to see Tristan get a ticket to Hollywood. “When I walk in the room, I feel like my mom’s gonna be there in spirit,” she said, before Harry Connick Jr. read a surprise email from her mom and then OH WAIT WHAT’S THAT THERE’S MOM.